When you’re planning on getting your first tattoo, the potential impact on your health may be the last thing on your mind. It’s normal that young people are far more focused on choosing the perfect design rather than whether there is anything to be worried about in terms of your health. After all, everyone has a tattoo nowadays! Research suggests that around 10% of women aged 18 already suffer from venous reflux, or hidden varicose veins. However, if you do have the condition it is likely that you won’t notice the symptoms or visible varicose veins for years or even decades. But, a tattoo can affect the severity and treatment of the condition in later life. Varicose veins occur when veins become swollen and enlarged due to blood pooling. Often these damaged veins protrude from the skin, taking on a purple or red color and can be painful as well as unsightly. Although anyone can develop the condition and around 25% of all adults suffer from it, it tends to be more common in women, partly due to the hormones secreted during menopause or menstruation and the additional strain placed on the veins and valves during pregnancy. How can my tattoo be a danger to my health? Tattooing requires the skin to be pierced and for ink to be deposited into the dermis layer of your skin, below the epidermis, or the outer layer. The epidermis sheds throughout your life so to ensure that the tattoo is permanent, the ink needs to reach the dermis. The dermis is made up of a delicate combination of nerves, glands and blood vessels which play a vital role in your general health. When you receive a tattoo, your body’s immune system reacts by sending white blood cells, or macrophages, to consume the ink particles and ensure the dermis remains healthy. Many of these white blood cells return to the liver so the waste products, in this case the ink can be excreted, however, some macrophages stay in the tattooed area with the ink particles which is why your tattoo doesn’t fade. However, getting a tattoo can cause damage to the blood vessels in the dermis, especially if you are already suffering from varicose veins or venous reflux as you may be at greater risk of severe side effects including excessive bleeding and even skin ulcers. The biggest concern when tattooing over an area displaying symptoms of varicose veins is the potential risk of damage to the blood vessels. As these veins become enlarged and rise to the surface, the chances of a tattoo needle coming into contact with the blood vessels increases. In some cases, the ink can be inadvertently injected directly into the veins rather than the dermis causing infection as well as distorting the image of the tattoo as the ink flows through your veins. It can also be problematic if the needle comes into contact with the blood vessel, even if ink does not enter the vein, as this can prevent the vessels from functioning normally. 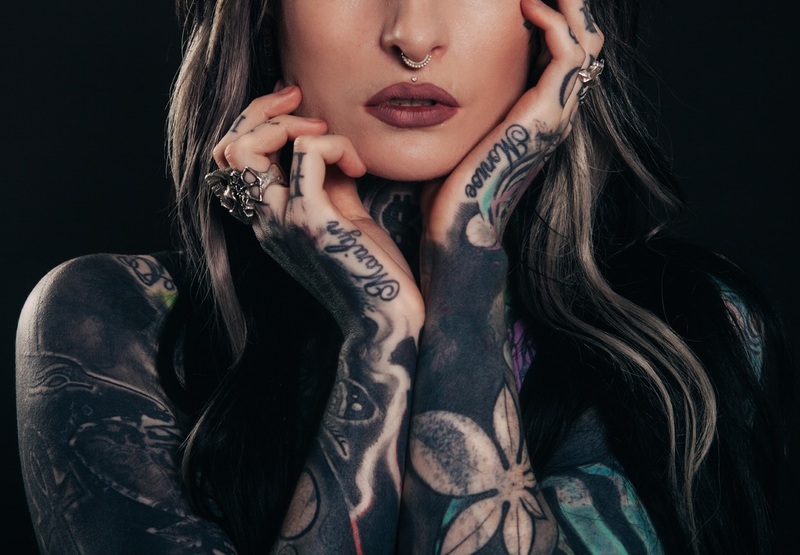 In the vast majority of cases, the tattooing procedure will be completed without threatening or damaging your blood vessels, however, this does not mean that it cannot have an impact in later life. In fact, covering an area of varicose veins with a tattoo can make later treatment difficult and riskier in some cases. Can I manage or treat my varicose veins if I have a tattoo? There is no need to panic as treatment is available if varicose veins develop underneath a tattoo that you already have. The steps you can take to manage and treat the condition can depend on a variety of factors such as the severity of the damaged blood vessels and where the varicose veins and tattoo are located. There are several very simple methods available that allows sufferers to manage the discomfort of varicose veins, including ensuring that you exercise regularly and wear compression socks to alleviate the symptoms. However, you will need to speak with a specialist to find out how the most effective treatments can transform your life. According to an expert in vein treatments, Endovenous Laser ablation is the most effective option when treating varicose veins around a tattooed area, offering a very high success rate with a far lower risk of complications compared to other treatment. This technique is minimally invasive and uses heat energy to seal the damaged veins for a period of time in order for them to recover. During this time, blood flow is redirected via the healthy veins. Despite what you may have heard in the media, young people are also at risk of developing varicose veins so it is vital that you consider the implications of getting a tattoo in high-risk areas such as the legs, especially if you have a family history of the condition or think you may be experiencing symptoms. Remember, it is always best to consult with a specialist before you get your tattoo! Next articleHow to Be an Excellent Teacher?